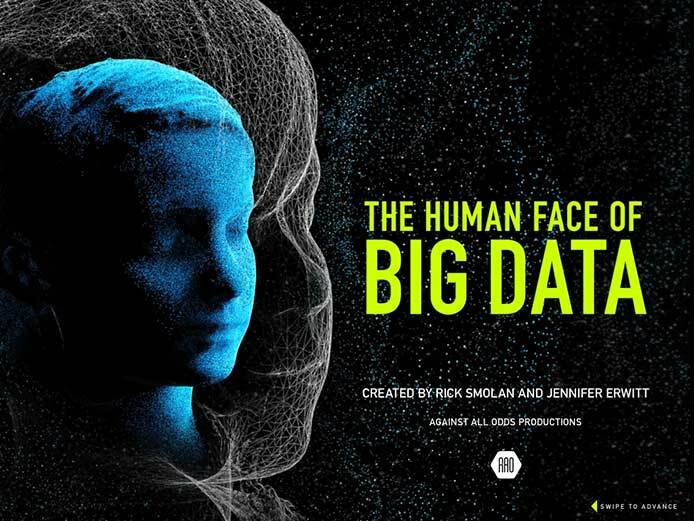 The brainchild of photographer and author Rick Smolan, "The Human Face of Big Data" app offers a well-curated collection of tantalizing essays and photographs delving into Big Data, a revolution in information and analytics that is changing the very world we live in. An interactive version of the print book by the same name, Smolan's Big Data app is of the same well-received pedigree as his previous "America 24/7" and "Blue Planet Run: The Race to Provide Clean Drinking Water to the World" projects, each of which provokes reader introspection as to the state of humanity. 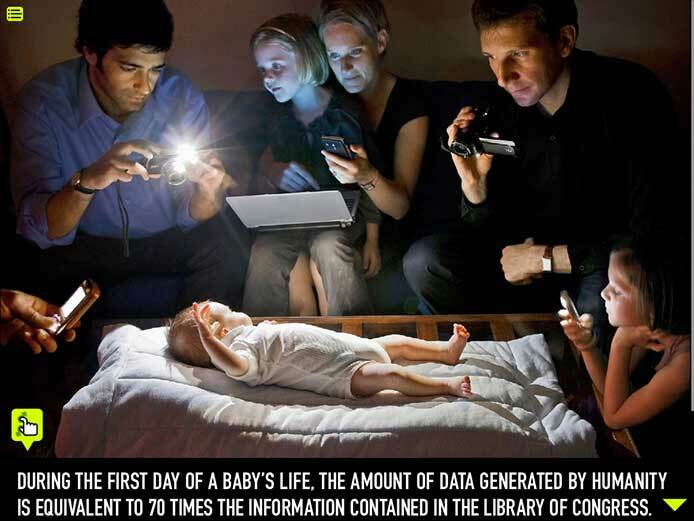 With the new book and app, the discussion turns to a vague notion not-so-simply described as Big Data. Most of the human race is part of it, a bulk unwittingly so, with the movement edging ever closer to becoming so vast and powerful that it may very well be more important to our future collective culture than the internet. But the term is not yet a buzzword. Smolan's Big Data looks to push the idea and what it means to the fore. "What we're trying to do is start global conversation," Smolan told AppleInsider, adding that one of the main goals of the app was to spark interest in Big Data's effect on humanity. "The average individual is not thinking very much about how it's going to change the world that their children grow up in, or how it's affecting their aging parents." 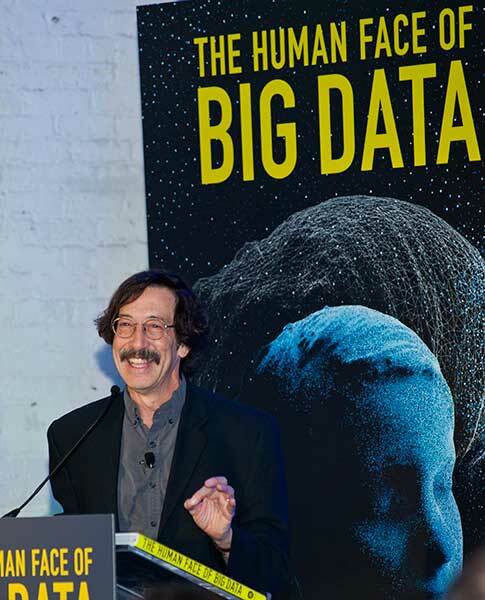 The Human Face of Big Data creator Rick Smolan. In his pitch to the project's main sponsor EMC, Smolan said he wanted to put a human face on Big Data, a concept many are unlikely familiar with despite being an integral part of, either actively or passively. Basically, Big Data can be described as a vast collection of data pooled from billions of handsets, ATMs, internet searches, traffic cameras and other connected devices, but more importantly it's how that data is categorized, processed and ultimately used. Smolan puts it more eloquently: "It's like watching the planet wake up, and the iPad app tells that story." Another analogy comes from Marissa Meyer, president and CEO of Yahoo!, who likens Big Data to a planetary nervous system, where the Earth is a large organism slowly coming to life as more and more receptors (people) contribute sensory data to the fledgling life form. The idea to take on such a heady subject actually came from Smolan's father, who floated the idea of investigating how countries around the world approach medicine. It turns out there was such a disparity in attitudes toward health and healing that Smolan took interest in other facets of the supposedly universal human condition. The seed of an idea grew into a series of books on emerging topics, from the impact of the internet to the global water crisis, and now Big Data. Of the stories and photographs incorporated in the book and app, a few standouts include pieces by Priceline founder and TEDMED curator Jay Walker and former journalist-turned-angel investor Esther Dyson. Walker, who owns a 50,000-volume private library dubbed the "Walker Library of the History of Human Imagination," offers a piece of his collection: a small book titled "Bills of Mortality." Printed in 1664, the book quantifies the deaths and births in London over the span of one important year in England's history, that of the Great Plague of London. From this one volume, Walker contends, the whole of Western civilization was altered as it presented context to the spread of the disease, an entirely new way of understanding data at the time. In Dyson's Pulse of the Planet essay, she writes that three things have led to a change from the Computer Age to something wholly unknown. "That is, humans will no longer be the center of the data solar system, with all of the billions of devices orbiting around us, but will rather become just another player, another node, in an increasingly autonomous data universe." The internet has joined the masses and produced so many new interconnections that it has "taken on a life of its own," while smart devices have become increasingly portable and "self-aware" to the point where they are now indispensable in the digital world we have created. Third is analog measurement, which has seen a resurgence with the burgeoning sensor industry and provides for analog-to-digital chips that serve as "brains and translators" in many mobile devices. These three things combine to from the perfect environment in which to gather data from billions of objects that operate and interact with each other, every one acting as a sensor "to take the pulse of the earth." As with billions of technology users worldwide, Smolan too has been directly influenced by Big Data. He tells a story of his 90-year-old mother who recently began falling as a result of aging. With children spread across different states, she didn't have the help needed to live alone , so her family hired a series of in-home caretakers. The adjustment to living with strangers was too tall an order, however, so Smolan had to look elsewhere. "Looking around for what other solutions were out there, I ran into Eric Dishman who runs the GE-Intel 'aging in place' research unit," Smolan recalled. "He told me about something they were working on called the 'magic carpet.' You install it in the home of your loved one and it doesn't say 'good' or 'bad,' it just says, 'This is how Rick's mom walks on a normal day.'" The "magic carpet" prototype takes samples of a person's gait, normal hours of activity, along with other metrics, and compiles a set of data in which "normal" patterns emerge. If these parameters are breached, for example when Smolan's mother is moving more slowly or hasn't touched the carpet for an extended period of time, the system sends message to alert a family member of the situation. Smolan also described how he and his brother can track and compare sleep patterns with Jawbone's Up band even though they live on opposite sides of the country. This micro-level data gathering and analysis is representative of what Big Data is doing on a global scale. 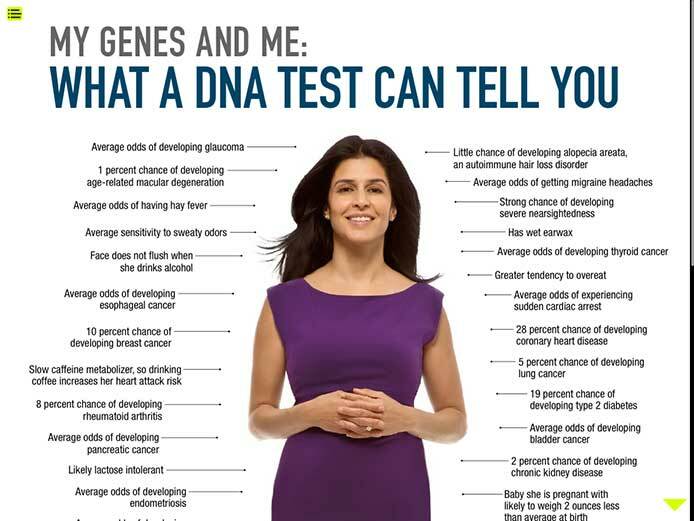 Another tangible example presented in the app is personal genome service 23andMe. For $299, a 23andMe customer can send in a spit sample for DNA analysis to discover ancestry, likelihood for inherited medical conditions and other traits based on known genetic studies. While the company's data is private and represents amazing prospects, some worry iterations of the technology may one day be used for insurance profiling or borderline-nefarious purposes that could limit the freedoms enjoyed by modern man. 23andMe encapsulates the nature Big Data; depending on how we choose to ply the gathered information, a future of great knowledge or great restraint awaits. It asks the question of how technological progress affects humanity for the positive or the negative. As is the case with many such queries, the answer remains unclear, and rightfully so as is the purpose of philosophical dialectic. In the case of Big Data, where little to no attention has been minded outside of big business and students of tech, such a question is important, but the adventure toward an answer could be even more so. As Smolan said, Big Data is meant to spark discussion, and it does just that by being one of the first sources to bring the idea to the mainstream. Apple's iPad was a perfect companion to the new book, said Smolan, as it combines the interactive experience people have come to enjoy when digesting media, with the attributes of digital distribution via the App Store. "I've always loved the idea of using new mediums to do storytelling, and the iPad is such a powerful way of doing that," he said. "The app is global, it'll be in all the Apple [App] Stores worldwide. The ability to scale with the app and to do some these interactive things where you give people the ability to watch videos is very seductive." On that front, the app is streamlined with all video content pulled from the Web, allowing for a relatively small footprint on a user's iDevice. The Human Face of Big Data can be purchased in the App Store starting today for $2.99, with proceeds going to Charity Water, a non-profit dedicated to delivering pure, clean water to people in developing nations. For young adults interested in comparing a few anonymous data points in their lives with others around the world, the Human Face of Big Data website offers a free interactive program called "Data Detectives."